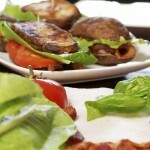 BLT Potato Sandwich-What the "Forks" for Dinner? You make a really nice dinner…..you make baked potatoes………dinner is over……..What do you do with the left over bakers????? You make BLT Potato Sandwiches of course! This is more of a method than a recipe. 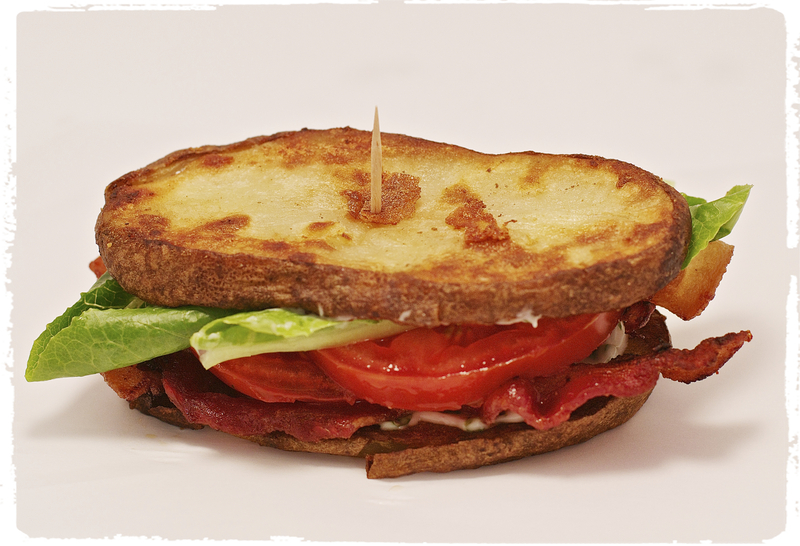 The standard BLT is made up of five ingredients: bacon, lettuce, tomato, mayonnaise, and bread. The BLT evolved from the tea sandwiches served before 1900 at a similar time to the club sandwich. The first “recipe” for a BLT was published in the 1903 Good Housekeeping Everyday Cook Book, a recipe for a club sandwich included bacon, lettuce, tomato, mayonnaise and a slice of turkey sandwiched between two slices of bread. But, everyone has their own way of making BLT sandwiches………. some like toast, some like variations on bread, which is where my recipe…….a.k.a. method comes in. Tim and I had a really nice steak and potatoes dinner one night. My intention was to make potato salad with the remaining potatoes. I was working on a BBQ recipe and we all know that BBQ needs either cole slaw or potato salad. That being said, I also have a ton of lettuce in my garden to use. Tomatoes are not ready yet………we had a very late start to the growing season here and a very cool summer so far, so things are not quite where they should be……but I digress. We also had some bacon to use up. 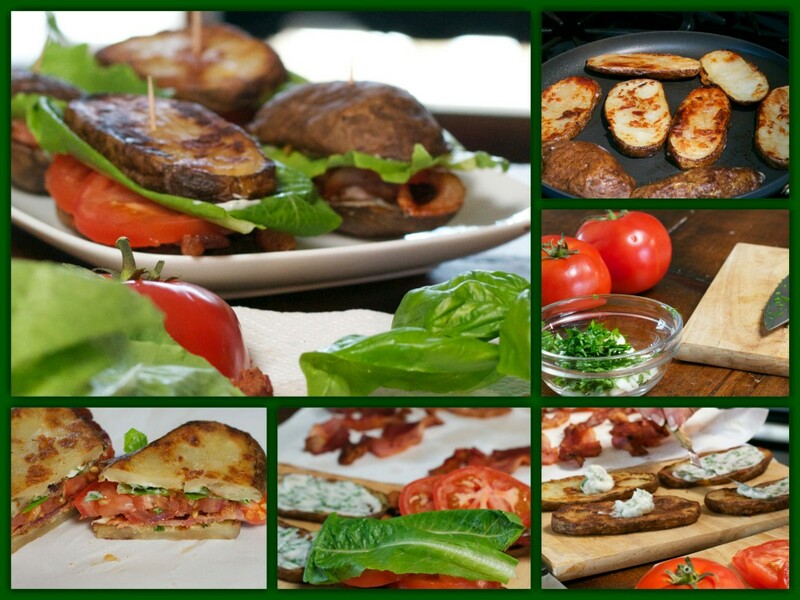 For me, a traditional BLT is on toast with chips on the side…….hmmmm……….why not use the potato for the base of my BLT. At first I was going to just warm up the potatoes and fill them with the BLT stuff, but as I looked at the potatoes I kept seeing bread. If I sliced them and sautéed them, maybe they would hold as the the bread………Glory Hallelujah it worked…..The “bread” for my BLT worked!!!! The rest of the story is a lot less note worthy………just your basic BLT with Basil mayo. Now, as with any BLT, use the bacon you like, whatever tomatoes and lettuce you grow or purchase from your local Farmers Market……..Please visit your local Farmers Markets, your support means the world to them and the taste of local grown is beyond compare! 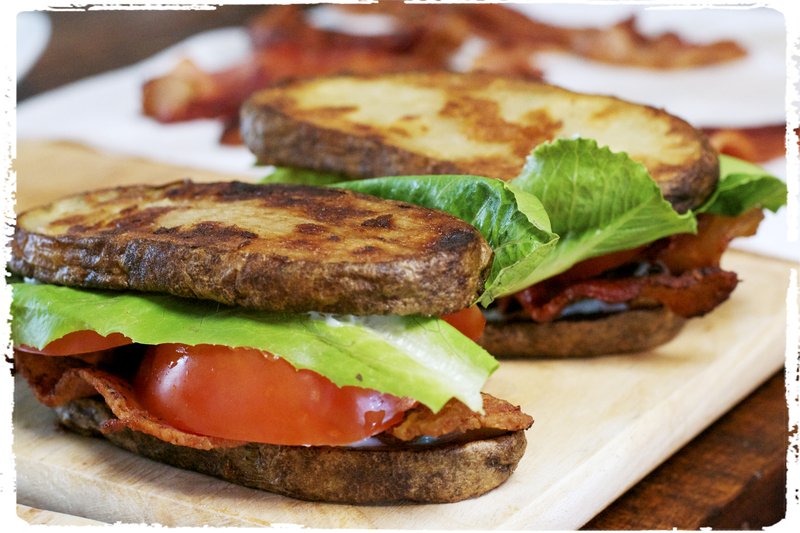 So the next time you are looking for something to do with those……..leftover potatoes……….try our BLT Potato Sandwich! Basil Mayo – 1/4 cup mayo or salad dressing mixed with 1 tablespoon chopped fresh basil. Spray potato slices with cooking spray. Sauté slices over medium to medium high heat until crispy. You are using the potato slices as the bread. Spread the basil mayo on the potato slices, add the bacon, tomato slices, and lettuce. Place a slice of potato on the lettuce to form your sandwich. Secure with toothpick. Thank you Donna. It was really good too!